When describing the intensity and devastation of conflict, there is an oft-used quote by Plato that is meant to punctuate, if not even end whatever discussion regarding war as a subject, as though there were truly nothing more to say: "Only the dead have seen the end of war." For many, including those still living who have experienced war, death is an inherent reality. But there are other fundamental realities of war that are equally as important, and especially among its survivors: the human effects of war -- from its precursors, the daily reality of its presence while waged, its aftermath -- including when one looks back on it and wonders what happened and why, if the truth might ever be known about certain events that many would like to remain hidden, and if the illumination of certain realities in war might help future generations to not make the same mistakes. Humanity is unfortunate in that we seem to have a short-term memory that, almost out of some kind of pathological avoidance, keeps us from remembering the past and learning from it, or if we do examine the past, getting caught up in politics to the detriment of fact, or any larger, more pervasive sense of truth. These are some of the considerations that French journalist, Rémy Ourdan, writer for Le Monde, and colleague, Nihad Kreševljaković, Festival MESS Memory Module art director and director of SARTR (Sarajevo War Theatre), wanted to address during an event to commemorate the anniversary of the coverage of one of the most brutal wars in the late 20th century. Having organized "Sarajevo 2012," a meeting of foreign correspondents who had covered the war in Bosnia twenty years before, the response to the event by both journalists and the city itself were overwhelming. "We were surprised by how many reporters came -- hundreds -- and by how the city responded -- so warmly," says Ourdan. "And considering the enthusiasm from both reporters and and Sarajevans, we decided we had to start a new project." 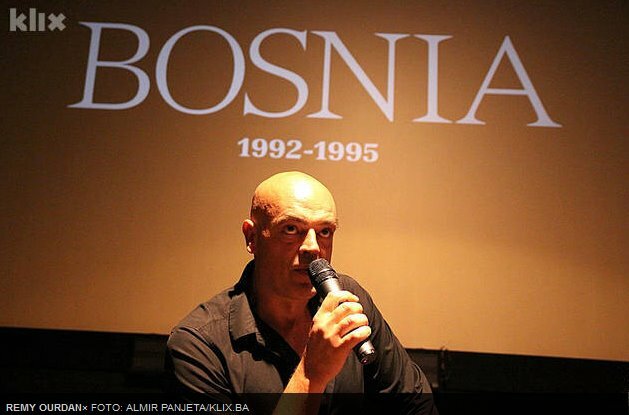 While a photo book, Bosnia 1992-1995, had been created to commemorate the anniversary, and to be shown on screen for the event (then launched during the Sarajevo Film Festival in 2012), the reception created the inspiration for a further-reaching initiative that eventually became the WARM Foundation. "Instead of working on a project on Bosnia or the Former Yugoslavia, as there are already many great initiatives going on, we decided to start a worldwide foundation on contemporary conflicts that would bring together the best reporters, artists, academics and activists, bring to Sarajevo the most talented people from all around the world, bring together people with a common passion for 'telling the story' with excellence and integrity." In terms of having Sarajevo as its home: "... we are glad to do it in Sarajevo, a city which is not only a symbol of war and tragedy, but also a symbol of resistance and survival." One major part of WARM both in terms of its origin and its mission is in continued attention to journalism and its integrity. This comes from a recognition that much of today's immediate information and the most intensive stories about war come from print journalists and photojournalists. Gary Knight, VII Photo agency Co-Founder, WARM member and Founder of Tufts University's Program for Narrative & Documentary Practice, noted "journalists are often positioned as first draft historians," while noting that this may indeed not be their intention. But for many, who live under the yoke of despotic governments for which free press may not have been as pervasive, or where even now press freedom may be subjugated to the interests of the state, its importance can nevertheless be profound. "Journalism is about bringing accurate information to people," says Ourdan. "When I started reporting 20 years ago, we were able to do it only for people living in democracies and open societies. Today, with satellite TV and internet, we can do it worldwide. You never know who your story will reach." This includes in areas currently embroiled in conflict. "People trust us to tell the truth to the world. They are in the most extreme situation of their lives, sometimes the most tragic, they want us to tell the story... they want us to tell their story... the frustration of [a] population usually doesn't come from wrong reporting but from the absence of political consequences." "This year my newspaper, Le Monde, ran a long story on the use of chemical weapons in Syria. Our reporters were direct witnesses of chemical bombings, were themselves exposed, and brought some samples back to France, which were tested positive to sarin. The least we can say is that it didn't change much in international policy towards Syria. That's not the reporters' responsibility, they did their job extremely well, but for the people and the rebel fighters exposed to sarin, for the doctors who gave the samples, there is a frustration of not having been able to change western policy." But this is also WARM's purpose: to continue telling the truth, with integrity, until there is some effect, as one primary responsibility is to the people who have been, and continue to be, affected by war. Ourdan said, "We don't know how many people read our stories and see our pictures, we don't know if they believe us, but we have to keep telling the story. We are the messengers. People living in war zones trust us, they ask us to report what they're going through." "You can 'tell the story' through art, not only through journalism. If you consider the war in Syria today, I believe the filmmakers from Abounaddara, one of WARM partners, are telling the truth as much as reporters. They are telling another side of the story, not so much about frontlines but about daily life in Damascus, about the Syrian ordinary people." "With this initiative and the idea of WARM maybe we can hope that some human values that we lost, could [return]. We already have a new test in Syria but unfortunately many other places around the world too. WARM will welcome the best and emerging reporters, artists and researchers from all around the world and provide an environment for them to work together." WARM will be holding its first festival in Sarajevo in 2014, which also coincides with the anniversary and location of the start of WWI.